Often left in oblivion, as if out of reach of tourism spotlight, Gorski kotar still enjoys the title of the green paradise on Earth. Hunters introduced us with just a tiny piece of it, Vrbovsko, since they might be the connoisseurs of this territory. This small city is located in the east part of Gorski kotar. Up in the north the river Kupa divides this territory from Slovenia, eastern borderline follows settlements Zdihovo, Liplje, Bosiljevo and cuts right through the valley of the river Dobra close to Ljubošina. The well known pleasure trip spot here is Kamačnik. The river bearing the same name has incised a canyon and along three kilometres engraved and coloured untouched nature, crystal clear drinkable water in creek rapids. 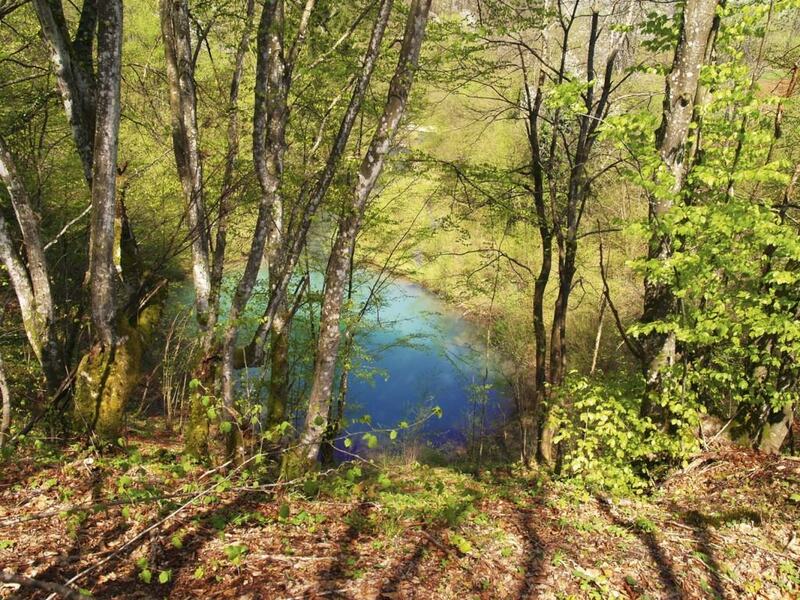 Our hosts, the hunters of the open hunting ground ‘Bukovača’ are proud of discovering a secluded beauty – a mesmerizing spring of karst sinkhole shaped as 17 m deep turquoise blue teardrop. This hunting ground is situated east of the river Dobra and spreads on 7432 ha of vast space. Salt stations, feeding grounds, watering places, ground blind and tree stands meet highly renowned hunting grounds requirements. Numerous sorts of wildlife still inhabit the woods of Gorski kotar being a rare thing in Europe. Brown bear belongs to the most attractive forest inhabitans, but also deer, doe, wild boar, the smaller ones are rabbit, fox, stone martens, badgers and the representatives of the feather family would be woodcock and quail. Brown bears tend to feel safer here in Croatian woods where hunting them is allowed than in Slovenia where bear hunt is legally forbidden. Sounds as a paradox and the subject is a tricky one, though it was announced by the scientists from the British Imperial College and the University in Zagreb. Anyhow they are not regarded as vermin attacking livestock, hunting method is under strict control and the bears are treated as treasure. The hunters report the number of bears has largely increased this year. 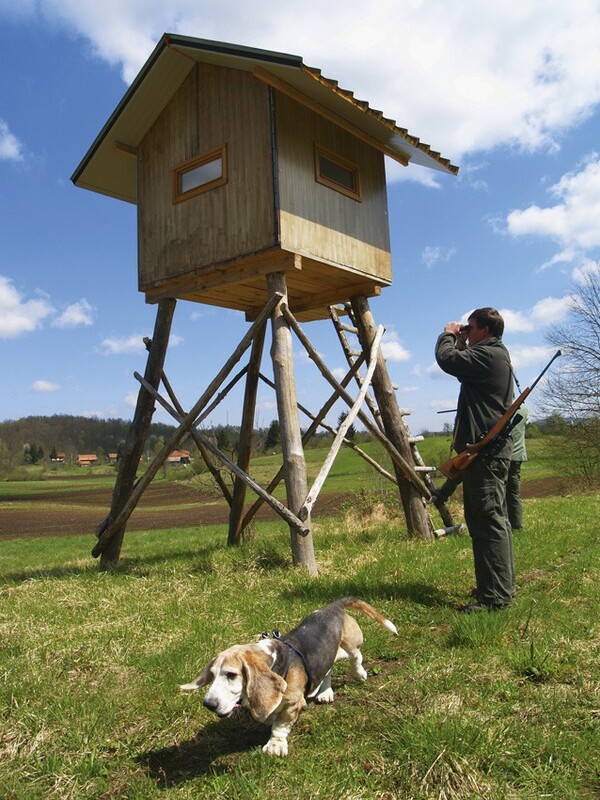 Hunting encompasses searching, observing and counting, breeding and feeding, tracking down, shooting and catching live game as well as releasing grown game. People are usually focused only on the shooting part and thus have a bad picture of hunting. If they saw hunters in winter time under 1 m high snow cover, protecting wildlife from predators, vaccinating foxes, providing animals with food and water, all this work under impossible usually life threatening conditions, would it change your point of view on hunters? At the end of the last year members of the ‘Bukovača’ society celebrated the day of their protector St.Hubert and prayed for mercy and their time in the nature to be a good deed bringing them peace and joy. They also prayed for the Lord’s grace to give them strength always to treat their hunting colleagues with respect, to make their shots clean and precise, not to cause unnecessary suffering to animals; to be wise when sharing prey with the hungry souls. In the end they expressed their gratitude for hunting with their friends and enjoying good company as well as the spirit of the good hunters’ tales. St.Hubert was a count at Theodoric III court. He was a hunter who renounced hunting and his property for the benefits of the poor and disempowered ones ever since a deer with a burning cross appeared in front of him while hunting. The mighty protector of the hunters and gamekeepers has been appealing on the hunting etiquette ever since. Hunting is an honourable activity as well as interaction between a man and nature. Those who lack hunting knowledge, complain a lot. Maybe they should try out being hunters observers just like us, while preparing this story, yet the hunting cuisine is another great story. Genuine hunter’s celebration can be experienced at Ogulin hotel Frankopan: venison medallion with sour-cherries or steak in plum sauce, venison, wild boar or bear stew. Wild game belongs no more to exclusive dishes, because it is available to a broad range of hedonists who pilgrim this fascinating facility. Sixteen luxurious rooms and four suits experienced a harsh battle with thirty-eight requirements Institute for Protection of Cultural Monuments imposed. The hotel is located right next to the Frankopan family castle built in 1500. Especially beautiful is summer outdoor terrace under authentic ambience of the 19th century. In the end we wish to all hunters good hunting and a steady hand. Special thanks goes to Ivica Milotić, originator of the whole idea who told us stories of natural beauties he, a pure Istrian soul, has discovered in Gorski kotar and thus threw the tourism spotlight on this unjustly left to oblivion piece of paradise.